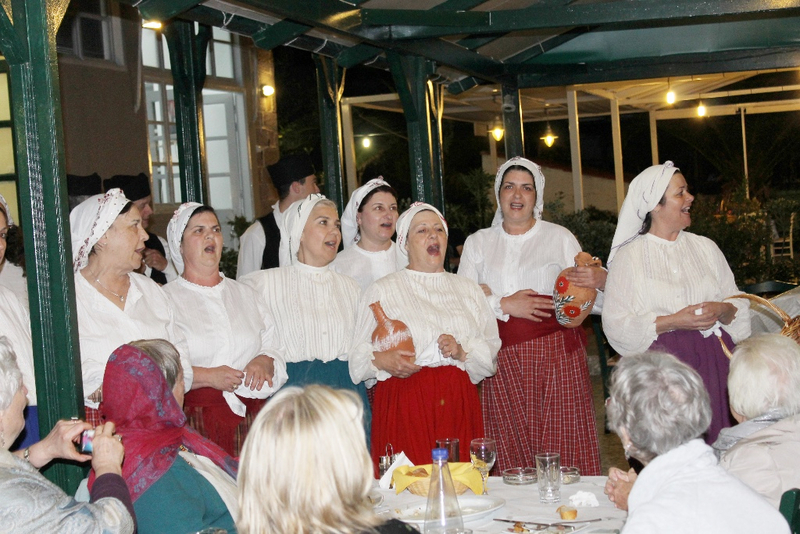 I invite you to join us on the Dance & Culture Holiday to celebrate Greek Easter in Milelja, Lesvos, 27 April - 11 May 2016. I will be sharing Greek, Balkan and Armenian traditional dances, with exquisite and sensitive live music provided by Kostantis Kourmadias and Nikolas Angelopoulos. Local teacher Rena Grigoriou will share Greek dances from Molivos and Asia Minor, and feminist theologian Carol P. Christ will give a talk on the Goddess in ancient Greece. The early booking discount applies until February 1, 2016. This year’s course is open to men and women, and also to non-dancers (ask about prices) so it is a good opportunity for holidays with your partner. 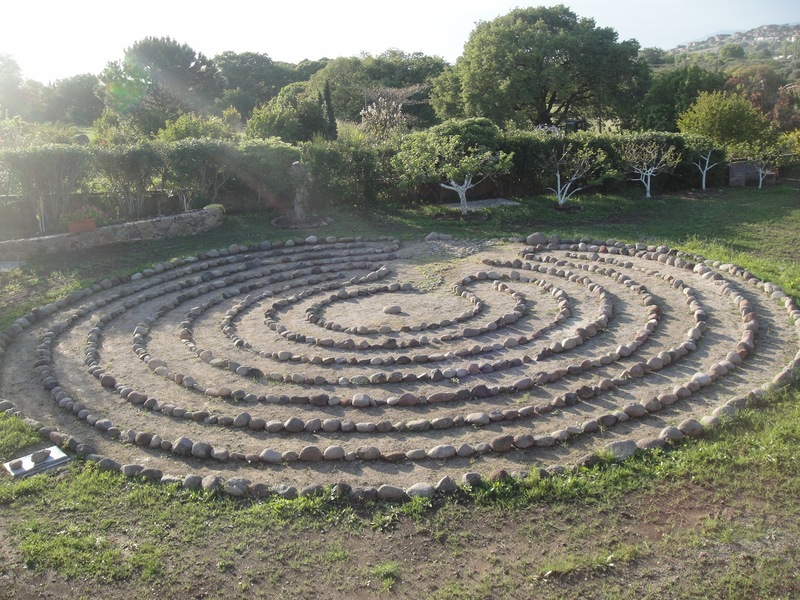 There is no course happening in Milelja the week of May 11-18, so there are rooms available if any of us would like to stay on for a non-structured holiday. 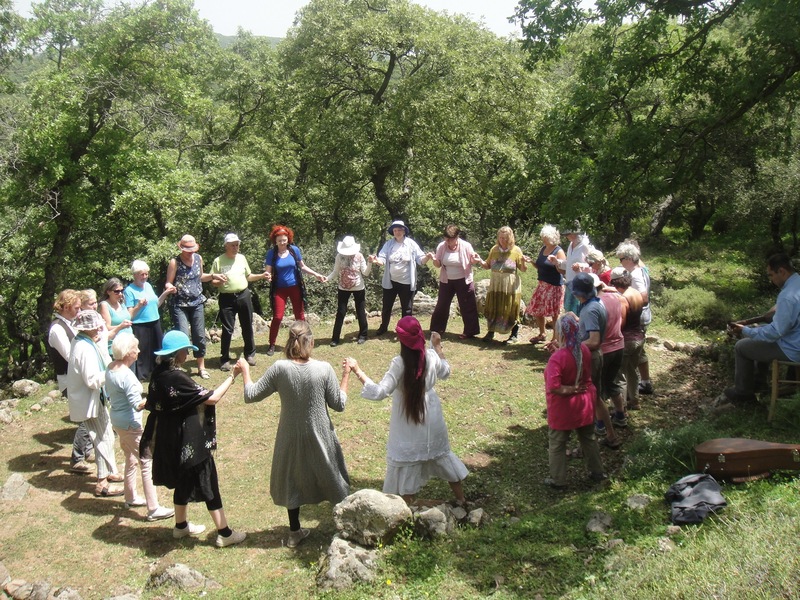 Milelja is such a beautiful place, especially in spring, and Easter is a very special time to be in Greece, where the ancient traditions really come alive and we are invited into the heart of them. It is a time to focus on rebirth and resurrection, both in the Greek Easter mysteries and in pre-Christian rituals honouring spring and Persephone’s return from the underworld. 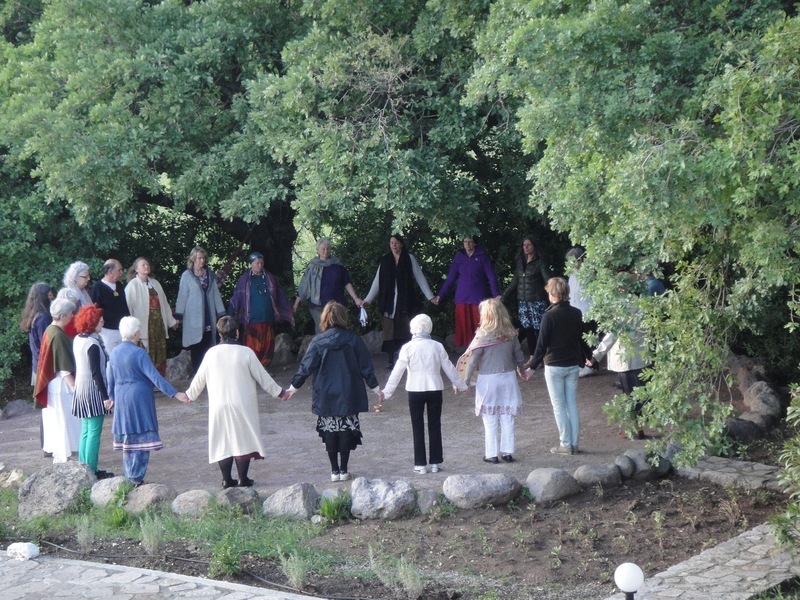 We will dance traditional ritual dances which emphasise these energies, so that we can work with these cycles consciously in our own lives, honouring both the descent and the emergence of new life. As you know, the island of Lesvos in the last six months has received thousands of refugees coming by boat from Turkey, mainly fleeing the war in Syria. Some of you have asked how the refugee situation will affect us, or how we can help. Things have changed a lot since last summer. Now there are reception stations set up on the beaches near Eftalou and Skala Sikammias, from where the refugees can travel by bus to the centres in Mitilini, so they no longer have to walk across the island to the capital and they no longer pass through Molivos or Petra. There are many local and international aid organisations helping to welcome and care for the new arrivals with food, clothes and medical care. Uschi and Irini, the owners of Milelja, have personally dispensed 30,000 euros’ worth of goods from donations made by guests like ourselves. They have also given much support to local Greek families, who as a result of the economic crisis also find themselves in need. This is enormously appreciated. Our presence, too, is a sign of support for residents of Lesvos and especially Molivos, who see in us a precious affirmation that ‘life goes on’ despite the recent challenges, and we will be made very welcome. So be assured, you will be able to relax and enjoy your holiday. Having time off is very important and Milelja remains an ideal place to rest, dream, dance, renew and take care of yourself on every level - even more so this year, when we may have our own dedicated bodyworker on site during the course. There are ways for you to contribute to the refugees if you wish to, either by making a donation, bringing extra clothes, or staying on to volunteer with one of the local groups (let me know if you would like more information about volunteering options). There are enough volunteers on the island already, so our hands-on help is not actually required. We dancers can best be of service by bringing our compassionate presence to the island and to the overall theme of exile and homecoming. 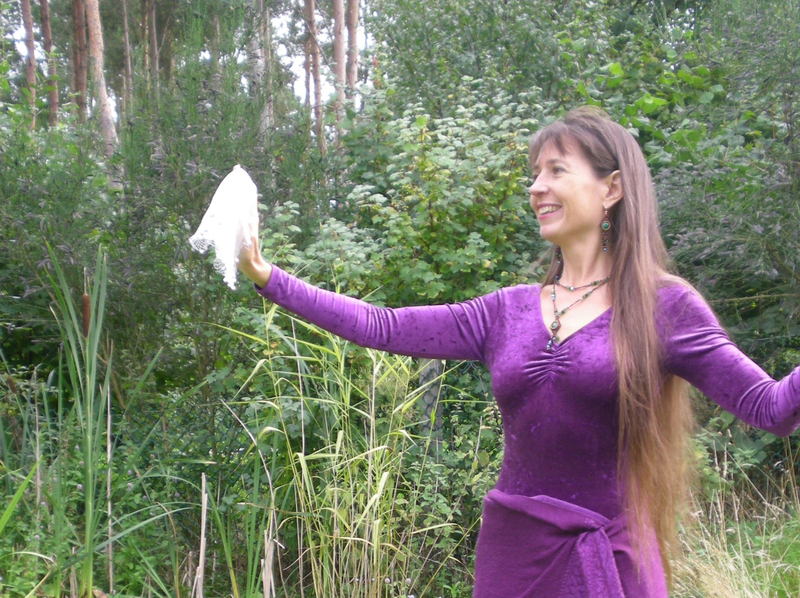 Many ritual dances serve as conscious containers to help hold, and heal, feelings which are too much for us to carry alone. It is not the first time streams of refugees have travelled through this part of the world; most inhabitants of Lesvos today are descended from the Greeks who left Smyrna as refugees in 1922. 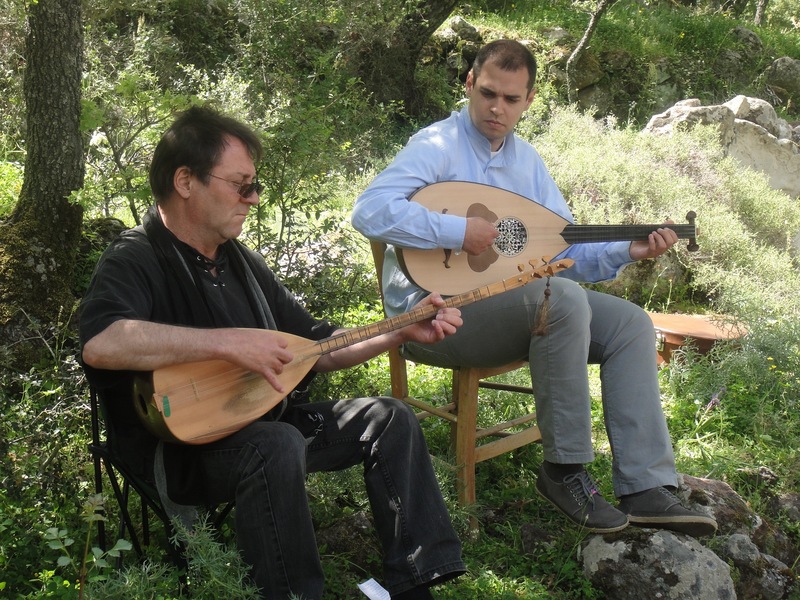 Kostantis, whose grandparents were among that wave of refugees, plays and sings the music of the Asia Minor Greeks in a way which both bears witness to the pain of the loss, and recreates the homeland through its music and dance. People in Molivos honour him deeply for his skill, and we are lucky to have him play for us. I find that most people have, somewhere in their family history, a story of some kind of loss or exile, and all of us have certainly gone through versions of it in our lives, perhaps many times - it is part of being human. This is not the only theme we will be working with in the dance, but it is one of the key ones, and the dance circle is the best place to witness and transform it. The dances of people who have survived can teach us emotional, physical and cultural resilience, and reconnect us with the joy which is so often obliterated through the experience of trauma. Sufi mystics also know: the yearning to return from exile inspires us to dance, because there is no other way to carry the feelings; then, paradoxically, the dance itself becomes the road home, the passport to the inner homeland of the dancing body. This is also the heart of the Easter mysteries and Persephone’s return. There is no greater joy than a return to the whole, full self, and to feel ourselves as part of the whole human community – this is the invitation of the circle. I hope we will be dancing together in Milelja this Easter! If you have any other questions, please email me. P.S. The dance course for the 2 weeks costs 695€ if booked with deposit of 250€ by February 1, 2016; 795€ thereafter. You can also pay in full if you prefer. Please see flyer for booking information and accommodation prices. In Greek myth, the Fates, the Moirai, are three sisters – Clotho, Lachesis, and Atropos – who spin, measure and cut the thread of life for every person born. Their rule is law; even the gods, so the legend has it, have no power to bargain with the one who cuts the thread and ends the life. Her name, Atropos, means ‘she who cannot be turned’. In Greece today, others are making the life-or-death decisions. It is not the three sisters of ancient folklore, but a bunch of men in suits now wielding the power to uplift or cast down an entire nation and its millions of citizens. I would like to shine a little light on just two of these groups of (mainly) men who have had the most impact on the recent decisions to bring Greece to the brink of bankruptcy, default and catastrophe. Today I am recommending several key articles. On the decision taken by the Greek people in their historic referendum Sunday, this blog by my friend and long-term Greek resident Carol P. Christ (who votes here and has also stood for election, twice, as a candidate in the Green Party). You can also leave comments. "Referendum in Greece: One Small Victory for the 99%"
"As Yanis Varoufakis revs off into the sunset, it’s his substance I’ll remember"
"Yanis Varoufakis: some of his best quotes"
I ask you to please continue sending compassionate thoughts and prayers to Greece now, for a peaceful and sustainable solution to the debt crisis, the humanitarian crisis, and the worldwide economic crisis precipitated by a deeply unfair system. Heute empfehle ich die folgenden Artikeln. Ich bitte Euch, euer mitfühlende Gedanken und Gebete nach Griechenland immer wieder zu senden, und griechische Tänze zu tanzen, für eine ruhige und nachhaltige Lösung zur Schuldkrise, zur humanitären Krise, und zur weltweiten Wirtschaftskrise basiert auf ein tief unfaires System. www.laurashannon.net - Find me on Facebook! We are at a crucial moment in European history. Please, light a candle today and dance, if you can, for solidarity with Greece and a European culture of democracy and peace. Shocking demands are coming from the record-breaking all-night EU summit – still ongoing as I write – which is attempting to impose unbelievably harsh measures on Greece. The Eurogroup is also demanding that the politically neutral state-run broadcaster ERT be shut down, leaving only private television companies long in the pockets of right-wing political parties on air. Please remember these essential facts: The original Greek 'bailout' loans only bailed out the banks. Austerity in Greece has brutally punished ordinary people and the poorest of the poor, not those who responsible for getting Greece into the debt mess in the first place. Those responsible – the crooked politicians of previous Greek governments who stole public money and signed the country up to the previous crippling bailout loans – are not suffering; in fact, they continue to profit from the crisis. The Syriza government was elected with the stated intention of ending corruption and tax avoidance, yet it has been met with contempt, not cooperation, by EU officials, who have barely disguised their aim to overthrow Syriza and replace it with the same corrupt politicians who held power before. Please, I encourage you to stay awake, stay aware, look behind the veil of mainstream media, and send your thoughts and prayers for a peaceful solution to this moment of crisis. Katrina van den Heuvel: Will Europe’s leaders come to their senses about Greece? To this last invitation, I add my own voice and encourage you to visit Greece this summer if you can. You will find that the ancient tradition of hospitality towards foreigners remains a sacred trust in this country, and you will receive a warm and genuine welcome wherever you go in Greece, whatever your country of origin. This is only one of many aspects of Greek society from which we non-Greeks can learn. Copyright © 2015 Laura Shannon. All rights reserved. You are in receipt of these emails because you have participated in or expressed interest in my dance events or have requested to join this list. It is not my intention to send unwanted emails and I will never pass on your details. We are all waiting to learn the outcome of today's referendum. While we wait, may I invite you to sign this Avaaz petition and stand with Greece on this historic day? It is in German, so I have translated the essential information for you below. Thank you for your support. And please, if you can, light a candle or dance a Greek dance in solidarity today. This week Greece could be forced to accept oppressive austerity measures or else be ejected from the Euro, with chaotic consequences. However, we can still claim our power to stand strong for social democracy and divert German Chancellor Angela Merkel and the other politicians from the path of austerity, so that the Greek economy can recover. Public opinion is important to the German Chancellor. Therefore let us gather our voices from all over Europe to affirm that people, not banks, must have priority, and to publicise our call in the press. Join us now by signing below where it says 'Unterzeichnen'. Two facts we must not allow to be forgotten in the discussions: 1, the public spending cuts in Greece have hit the weakest members of society the harder. Four out of ten children live in poverty, infant mortality has risen by 43% and youth unemployment is over 50%. And 2, it was all for nothing. The debt problem has gotten worse, not better. More of Merkel's austerity policies will certainly lead to even greater suffering and even more debt. Nevertheless, Merkel and the creditors want this irresponsible austerity policy to continue. However, Angela Merkel does listen to the voice of the people and can be willing to change course in decisive moments if the public demand. After the Fukushima nuclear catastrophe and large protests against nuclear energy, Merkel decided to phase out nuclear power plants in Germany in response to those events. It's true that political corruption, mismanagement and irresponsible lending practices helped lead to the Greek economic collapse. yet, over 90% of the 'bailout' fund went straight to the foreign banks which had lent money to Greece before the crisis. Greece obeyed the austerity measures and privatised, deregulated, cut pensions and salaries and raised taxes as the troika demanded. However, as many experts predicted, the debt problem was not relieved by any of these measures. Instead, the poorest were made to suffer disproportionately, as the wealthy Greeks had already moved their money out of the country. This bitter deadlock did not have to lead to the popular vote now confronting the people with a difficult choice. Many economists and important decisionmakers are united in the opinion that a debt conference with the aim of restructuring and reduction of the Greek debt offers the only possibility for the Greek economy to catch its breath and recover enough to pay back the rest of the debt within a sustainable time frame. bring about a decisive change in policy, so that humans and not banks have priority in society. diese Woche könnte Griechenland zu erdrückenden und erfolglosen Sparmaßnahmen gezwungen oder zum Austritt aus dem Euro gebracht werden. Europa würde so im Chaos versinken. Doch wenn wir uns Hand in Hand für eine soziale Demokratie starkmachen, könnten wir in dieser Krise gerade noch die Kurve kriegen! Fest steht, dass wir bei der ganzen Debatte zwei Fakten nicht aus den Augen verlieren dürfen: 1. haben die Kürzungen der öffentlichen Ausgaben in Griechenland die schwächsten Bevölkerungsgruppen am härtesten getroffen. Vier von zehn Kindern leben in Armut, die Säuglingssterblichkeit ist um 43% gestiegen und die Jugendarbeitslosigkeit liegt bei fast 50%. Und 2. war alles umsonst. Das Schuldenproblem ist nicht besser, sondern nur noch schlimmer geworden. Mehr von Merkels Sparpolitik wird also wohl auch mehr Leid und mehr Schulden bedeuten. Dennoch wollen Merkel und die Kreditgeber diese unverantwortliche Sparpolitik fortführen. Das sei im Sinne der Öffentlichkeit, behaupten sie. Diese Woche hat Premierminister Tsipras zu mutigen demokratischen Mitteln gegriffen und sein Land aufgefordert, „Nein“ zu sagen. 70 Prozent der griechischen Avaaz-Mitglieder sagen, sie werden das tun. Wenn wir ihnen zahlreich zur Seite stehen, können wir unseren Politikern zeigen, dass die Öffentlichkeit kein Leid mehr sehen will und stattdessen den Schuldenabbau fordert. Machen Sie jetzt mit — wenn wir genügend Stimmen erreichen, verbreitet Avaaz unseren Aufruf in der Presse. Angela Merkel hört auf die Stimmen der Bevölkerung und ist in entscheidenden Momenten zu einem Kurswechsel bereit. Nach der Katastrophe von Fukushima und großen Protesten gegen Atomkraft in Deutschland beschloss sie damals, Deutschlands Atommeiler abzuschalten. Und ja, politische Korruption, Misswirtschaft und unverantwortliche Kreditaufnahmen haben zum Kollaps der griechischen Wirtschaft beigetragen. Doch während 90% der Rettungsfonds in ausländische Banken geflossen sind, die Griechenland vor der Krise Geld geliehen hatten, haben die Griechen Sparmaßnahmen befolgt, privatisiert, dereguliert, Renten und Gehälter gekürzt und die Steuern erhöht. Doch wie von vielen vorhergesagt, wurde das Schuldenproblem dadurch nicht behoben. Es sind die Ärmsten, die leiden, denn reiche Griechen haben viele ihrer Gelder bereits abgezogen. Diese bittere Pattsituation muss nicht zu einem Volksentscheid führen, der die Menschen vor eine schwere Wahl stellt. Viele Wirtschaftswissenschaftler und wichtige Entscheidungsträger sind sich einig: Eine Schuldenkonferenz zur Restrukturierung und Senkung der griechischen Schulden würde der Wirtschaft die nötige Atempause verschaffen, um sich zu erholen und die restlichen Schulden mit der Zeit abzubezahlen. Eine Krise in eine Chance verwandeln — das kann eine Gemeinschaft mit unserer Kraft und Größe am besten. Die derzeitige Krise könnte zu einem historischen Desaster werden. Doch wenn genug von uns mitmachen, könnten wir Merkel von einem Kurswechsel überzeugen und zeigen, wie eine europäische soziale Demokratie in Aktion aussieht. Heute liegt es an allen von uns, ein humanes Wirtschaftssystem zu fordern, bei dem der Mensch im Mittelpunkt steht. Damit können wir jetzt in Griechenland anfangen. Alice, Ricken, Spyro, Alex, Marigona, Mike und das ganze Avaaz-Team. You are in receipt of these emails because you have participated in or expressed interest in my dance events or have requested to join my list. I hope these messages help strengthen your connection to the wisdom of the dance. It is not my intention to send unwanted emails and I will never pass on your details.